Fitbit – See just how active you are! 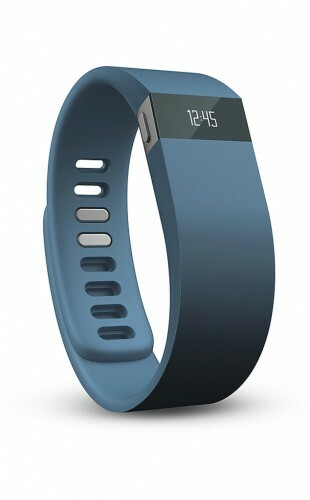 For Christmas I bought my mom (and myself) a Fitbit Force. This device is worn like a bracelet and tracks how many steps you walk, floors you climb, calories burned, and active minutes each day. It also displays the time so it can replace your watch. It’s comfortable to wear and you pretty much wear it all the time. I take it off when I get in the shower as it’s not waterproof. One of the coolest features is the Track Sleep. When you are ready to go to sleep, press and hold the button on the side of the band to activate the timer. Then when you wake up, do the same thing to turn it off. At first I thought this was just tedious, however it really isn’t. And don’t worry, if you forget to start or stop it, you can manually adjust the times. Pressing the button is mainly to places markers at the beginning and end of your sleep. One night I forgot to start the timer. I opened the phone app and added the time I went to sleep and when I woke up. It then showed me when I woke up, when I was restless and how many times. It’s pretty cool! About 2-3 weeks ago, I noticed a red circle area on my skin that was irritated. I know my puppy scratched me so at first I thought it was from her. It kept getting worse. I would apply Neosporin and itch cream to it every day and cover it with a band-aid. Then I could put the Fitbit over it. It wasn’t getting any better. The second bad thing about this, is wearing band-aids for extended periods of time, also gives me a rash. I’m either allergic to the adhesive stuff or the band-aid itself. Either way I was a mess. I began to think that maybe I was allergic to something in the band. It was weird that it wasn’t everywhere the band touched my skin, only in this one spot. So to do a test, I switched it to my right wrist. After about 10 days, I noticed the same type of rash developing in the same identical place. I took it off. I clicked on the HERE link and found out I’m not the only one with this issue. They have you fill out a form and gave you the option for a refund or a partial refund + another Fitbit item. Since I love the Fitbit so much, I didn’t want a refund, so I went with the partial refund + I requested the Flex in pink. Apparently they don’t have any skin irritants in the Flex – let’s hope! What great customer service too. I filled out the form on a Friday. Received an auto-email saying they’d respond within 48 hours. They responded in less than two hours. And by the end of Friday, I received an email stating it was shipped. Awesome!